The Three Pagodas of Chongsheng Temple are an ensemble of three independent pagoda towers arranged on the corners of an equilateral triangle, near the town of Dali, Yunnan province, China, dating from the time of the Kingdom of Nanzhao and Kingdom of Dali in the 9th and 10th centuries. 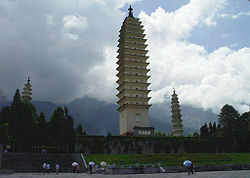 The Three Pagodas are located about 1.5 km (0.93 mi) north of scenic Dali, Yunnan province. They are at the east foot of the tenth peak of the massive Cangshan Mountains and face the west shore of the Erhai Lake of ancient Dali. This article uses material from the Wikipedia article "Three Pagodas of Chongsheng Temple (Dali)", which is released under the Creative Commons Attribution-Share-Alike 3.0 License.